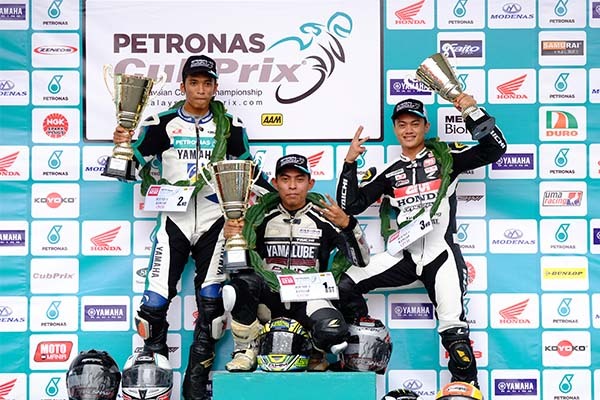 Yamalube AHM’s Ahmad Fazrul Sham consolidated his CP130 lead in the overall standings after he won his third consecutive race in a dramatic wet race in Round 6 of the PETRONAS AAM Malaysian Cub Prix Championship at Kangar, Perlis on Sunday. The 31-year old wrapped up the 18-lap race in 14’15.696s in a hard fought battle against Saturday’s pace setter, Ahmad Afif Amran. 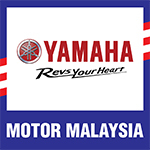 The two riders were seen going neck-to-neck before Fazrul Sham got the best of his PETRONAS Yamaha CKJ rival heading into the chicane in the final lap, where in a desperate attempt to claim his first victory for the season, Afif clipped Fazrul Sham’s rear tyre and crashed. Fazrul Sham went on to win the race with a 4.352 second advantage while Afif was able to recover his Yamaha and finish as runner-up in 14’20.048s. Meanwhile reigning CP130 champion, Zaqhwan Zaidi (Givi Honda Yuzy Racing) surpassed Rozaiman Mohd Said (Harian Metro Y-TEQ SCK Honda Racing) to steal third spot on the podium in 14’20.422s. Afif’s teammates, Mohd Fitri Ashraf Razali and Mohd Affendi Rosli who ere seen leading the race in the first two laps retired after crashing out in lap-2 and lap-6 respectively. Others who retired includes local born rider, Elly Idzlianizar Ilias, Zaidy Mohd Zaifaizal and Sasitharen Sukumaran. Hauling 95 points, Fazrul Sham opens up a 25 points advantage over his brother, Ahmad Fazli Sham (PETRONAS Yamaha Maju Motor) who finished 10th today followed by Abdul Muhaimin Roslan. “I’ve never been good racing in the wet so winning here in Kangar was a huge surprise. This was only possible because we had a competitive bike thanks to the engineers,” said Fazrul Sham. Commenting on his championship lead, Fazrul said 25-points is not enough to get comfortable just yet. “25 points can’t guarantee me the CP130 title as we have four more races to go and as we’ve seen today, anything can happen during a race. So my focus is to take a race-by-race approach, consistently get on the podium and pick up points,” he said. Round 7 of the PETRONAS AAM Malaysian Cub Prix Championship will be held at Teluk Intan, Perak this 19-20 September.